At this time of year, when the Christmas holidays are a distant memory and the summer seems so far away, escaping for a weekend is all we can think about. Nowadays, with the click of a button you can book a hotel room, flight, or train and be off within the hour, so always be prepared for those last minute trips with a roomy overnight bag that you can grab and go. 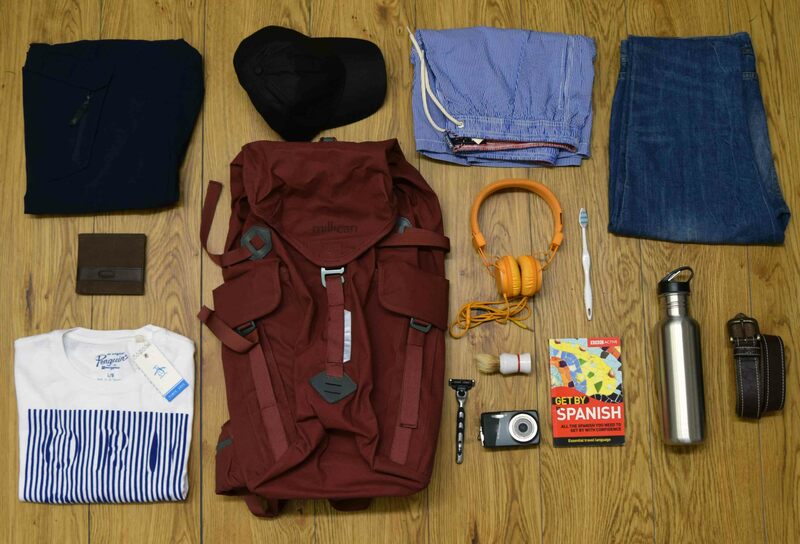 Our top picks on the blog today include practical backpacks, trendy holdalls, and even a wheeled option for hassle-free travelling. Filson bags have always been the symbol of high quality craftsmanship, and this Pullman Carry-On bag is no different. Featuring two carrying options, a leather shoulder strap and grab handle, this bag boasts robust details to ensure that it stands the test of time. The bag itself has been constructed from rugged 22oz abrasion resistant twill, making for a hardwearing outer. There are three separate compartments: the main section for clothes and essentials, the front zipped pocket ideal for travel documents, a wallet or phone, and back slip pocket which can easily store books, maps and magazines. Securing your items are two heavy duty zips that meet in the middle to allow for extra protection from theft, these travel around almost the entire perimeter of the bag, meaning it can be layed out flat like a suitcase, and features elastic straps to the interior to secure your belongings. Quintessentially Joules, this charming floral print canvas bag features a PU coating making it lightweight, water resistant and flexible. With two robust carry handles, this Joules bag also features two inner compartments for technology and other smaller valuables. There is easy access to the contents through the single zip pull closure, and the rigid base means that the shape is always well retained. The feminine floral print oozes summer style and is perfectly complemented by the neutral handles. This is the bag that does it all. With an impressive three ways to transport it, this 50L capacity bag is even compatible with airline hand luggage guidelines. For lighter journeys, this Musto bag can be worn as a backpack with the addition of the padded shoulder straps and lightly wadded back. When you’ve got a little more to take on a trip, there are two cleated wheels and an easy access pull along handle. If you’re in a rush, you can quickly grab the rubber grip handles that are conveniently place don both the top and side of the bag. Never worry about water damage to your belongings: this expertly designed bag features a full waterproof coating for protection against the elements. Easily access your essentials from the zipped outer pocket, while your valuables can be kept secure and organised in the interior compartment which features a large zip pocket, pen space and a Velcro pocket. The double rubber zip pull closure features a metal loop for the addition of a padlock so you can be sure your valuables are completely protected. 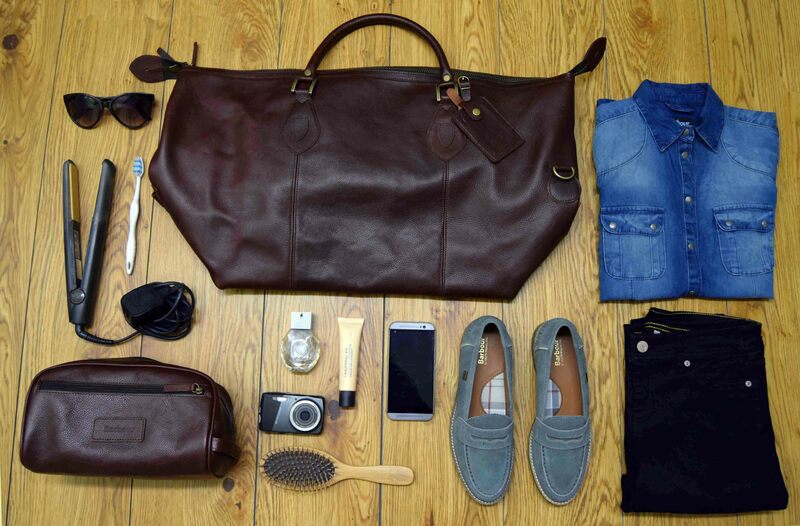 This stylish Barbour Leather Travel Explorer bag is deceptively roomy. With adjustable sides, you can adapt the bag to fit a selection of clothes, a pair of shoes, and a wash bag (plus all of your other travel essentials!). There are two carrying options available, rigid twin fixed carry handles made from hardy leather and a detachable shoulder strap with a canvas construction for extra support. For added convenience the bag features a full zip closure with two leather zip pulls and a leather address tag so you needn’t worry about lost luggage. All of your valuables can be kept safe in the inner zipped pocket, which is set within the Barbour house tartan lining. The style is incredibly versatile and not to mention timeless, so you can be sure that this leather bag will last for years to come. 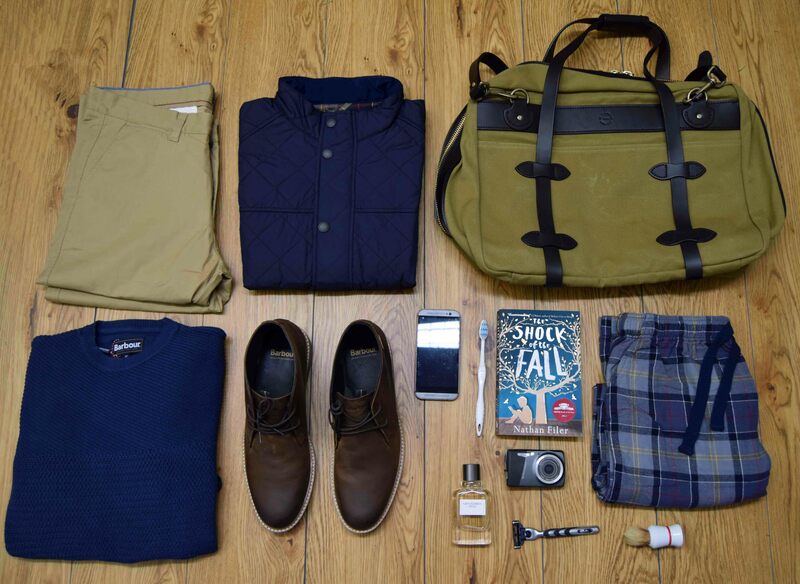 There’s so much to say about this multi-featured Millican Rucksack, we don’t know where to begin. The tall design means you will be able to easily fit in your outdoor gear or festival essentials. Wax impregnated, this weather proof rucksack features a padded back support, and shoulder and hip straps. For added support, there is the option of a sternum strap which can be easily adjusted. There is more than enough space for easily storing away all of your bits and pieces: there are zipped compartments to the hip straps, to the interior of the side pocket, and inside; two clipped pockets to the side and open pockets for easy access of torches, snacks, guide books and maps. If you’re going to be spending a large amount of time outdoors, there is space for a hydration pack, which doubles as a laptop compartment for less strenuous journeys. Safety features include a reflective strip along the back, and a clip on light facility for travelling at night. A grab handle at the top has been reinforced with leather for extra durability in a neutral grey tone. 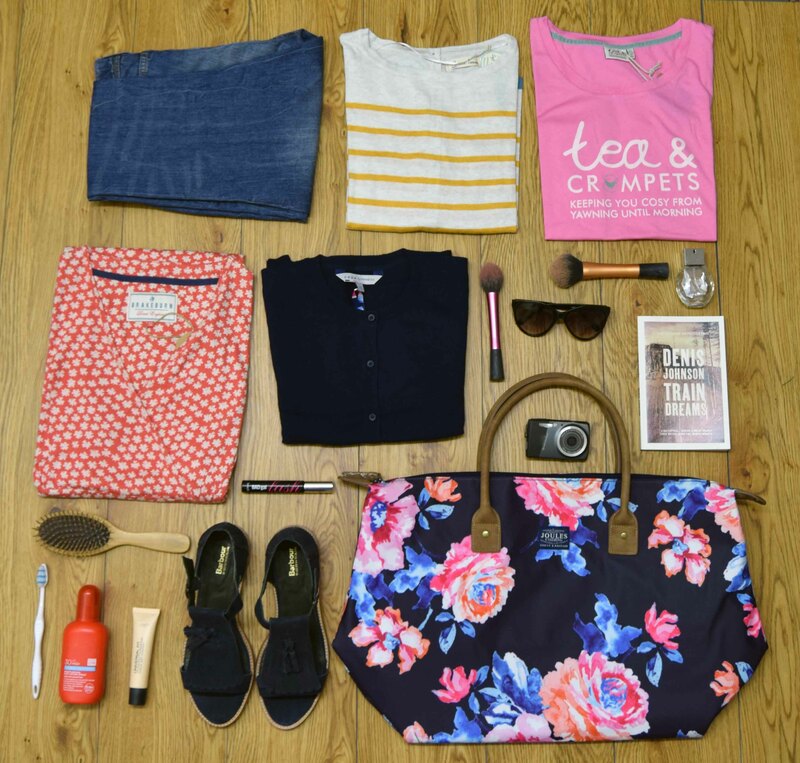 This bag would be perfect for a weekend away at the lakes, or a music festival. 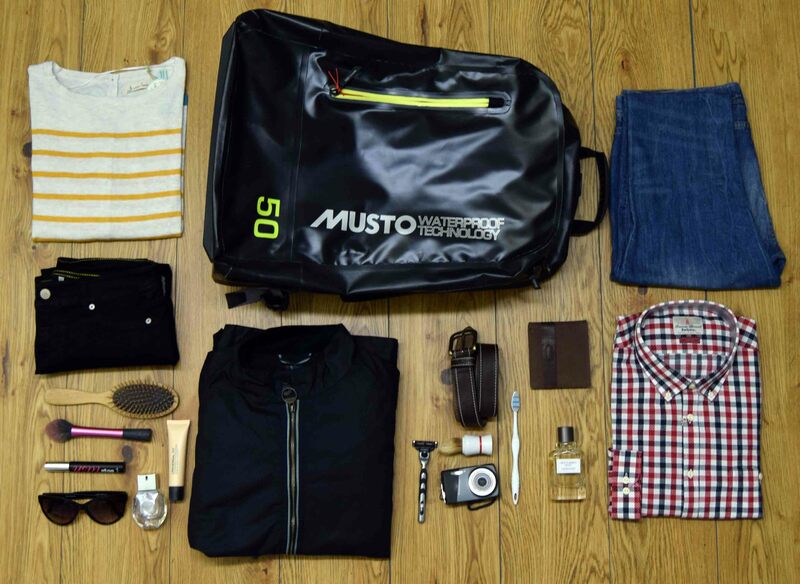 Our Winner: Musto Evolution Waterproof 50L Wheeled Bag. With easy transportation, a waterproof shell and multiple compartments this Musto bag is ideal for weekend or week long trips! We love the fact that with a push of a button it can be wheeled along behind you, and the main compartment is so roomy that you can pack enough for two- so one of you gets to travel light! You can view all of our bags and luggage options here.